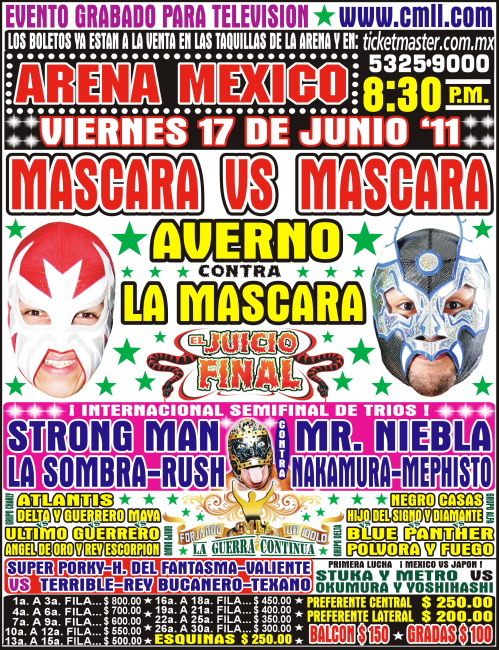 Maximo replaced Strong Man. Rudos took 1/3. Rush and Nakamura feuded, but weren't involved in the finish. 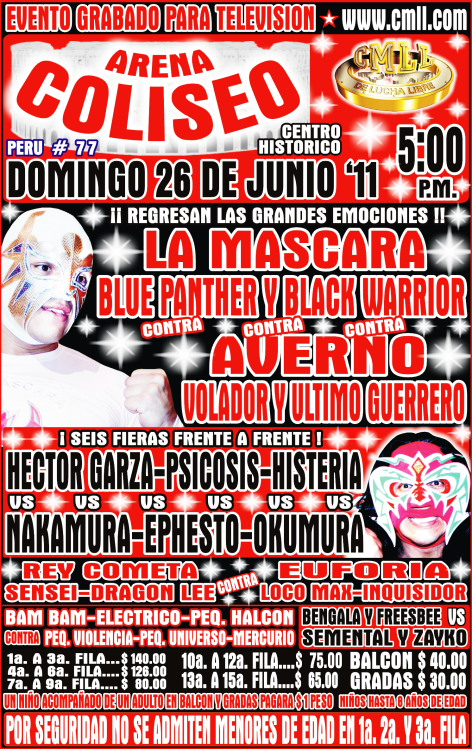 Halcon was listed on the rudo side, is not a fill in. Demus had an incident with a fan. Arana replaced Canelo Casas, Brujo replaced Destroyer. Arana was hurt in this match. 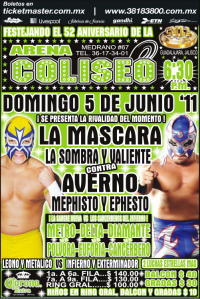 Averno pulled La Mascara's mask. 1) Ángel Divino & Príncipe Mixteco vs Dragón ROjo (indy) & Mixteco Jr.
5) Averno, Mephisto, Último Guerrero DQ La Máscara, Máximo, Volador Jr.
Mephisto replaced Atlantis, which doesn't really make any sense. 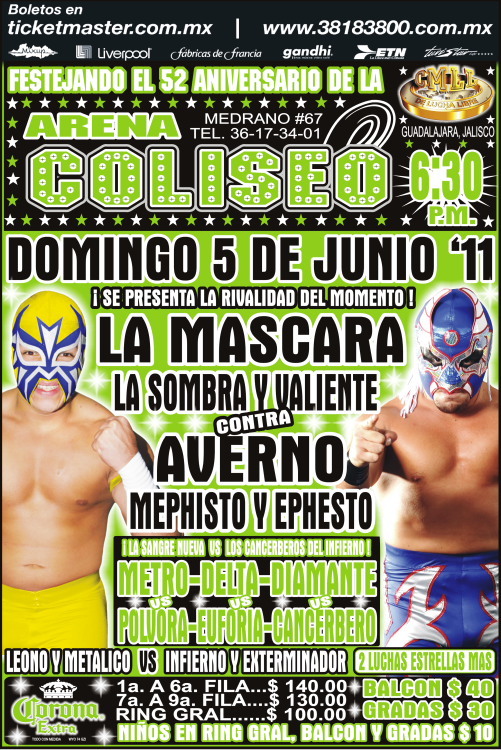 Averno pulled Mascara's mask. Maya's right shoulder was heavily taped. Rudos attacked it. Tecnicos took 1/3, Maya with a Mistica variant on Arkangel in the third. straight falls for the rudos! Clean first fall, and Averno got away with a foul on Mascara in the second. (Ref was Tirantes.) They did the 15 second hair/mask match - Mascara got in a headscissors and a machete before Averno just ripped off Mascara's mask and walked off. 2) Dr. X & Mortiz b Robin & Soberano Jr.
Hijo del Soberano listed as Euforia Jr. in the results. Mortiz was stretchered out after a Rey Trueno powerbomb. Guerrero Maya was the big hero for his team. Metal Blanco took falls 1/3 to keep the title. Naito got along with his partners and beat Fantasma. Rayo de Oro has now won 20 matches in a row since debuting. Straight falls for the champs. 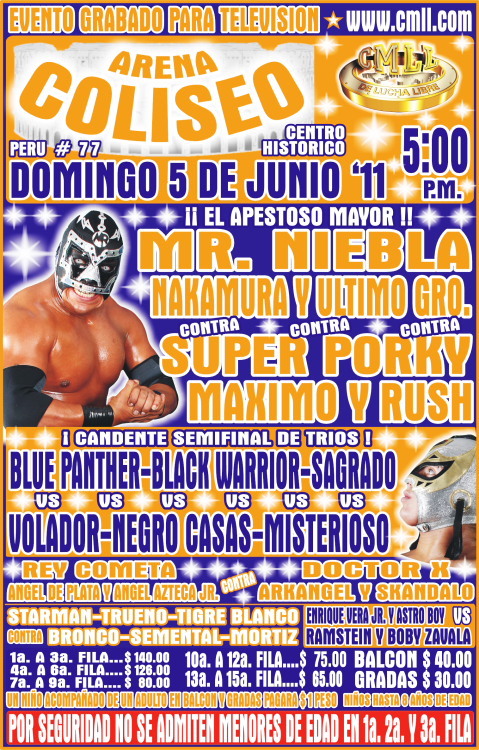 Rudos took 2/3, last fall coming down to Siki Osama beating Blue Center. Marcela replaced Luna. Rudas took 1/3. 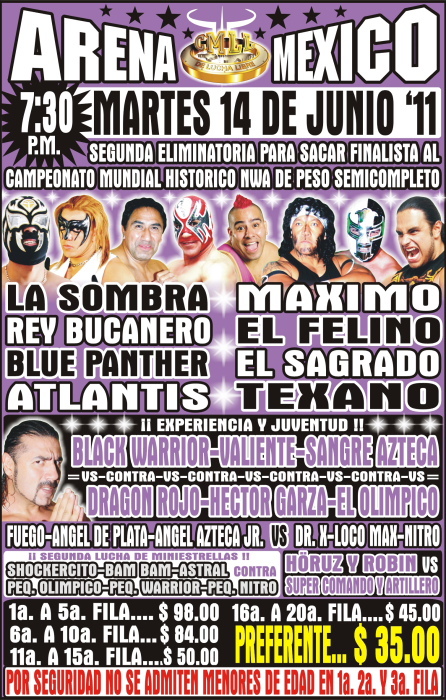 Felino replaced Misterioso, Angel de Plata replaced Diamante. Rudos took 1/3. Tecnicos took 2/3. Mascara got Averno with a campana. Another mask vs hair challenge. Metro replaced double booked Fuego. Okumura fouled Gallo in the third. 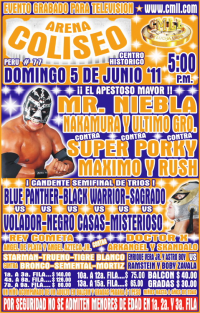 Rudos didn't always get along but did take falls 1 and 3, Aguila & Garza beating Sombra with a foul in the third.